Components are ordered separately to create this system. Die SOLAR1000 ist an automatische Wetterstation speziell für Solar-Anwendungen. Sie entspricht CaISO Standards. Das System kann problemlos an Kundenwünsche angepasst werden und mit z.B. zusätzlichen Kommunikationsoptionen ausgestattet werden. Typische Einsatzgebiete sind Bewertung von potentiellen Standorten für Solaranagen, Datenwefassung und Leistungsüberwachung. Die SOLAR1000 vereinfacht die Datenwefassung indem sie als Gateway für Daten vom Inverter, aus der Meteorologie und der Zähler dient. Vereinfacht Erfassung der Daten vom Inverter, Zählern usw. What is the Solar1000 intended for? The Solar1000 is both a station for resource assessment and power performance for photovoltaic power production facilities. 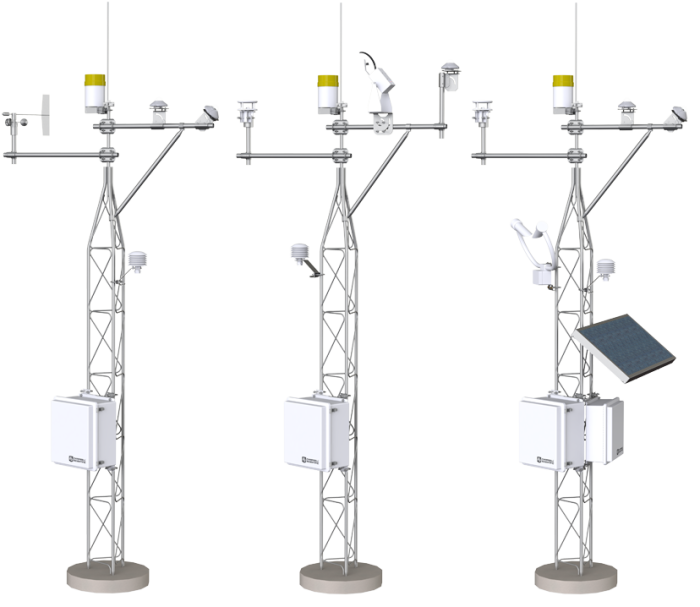 For example, this system may be used to quantify the potential power that could be generated at a proposed site. During and after construction at a site, the station can be used to provide data that isolates system inefficiencies and provides crucial information to funding agencies. Does the Solar1000 meet California ISO requirements? Yes. The Solar1000 has been designed to meet California ISO specifications. How much maintenance does the Solar1000 require? The solar sensors should be cleaned daily—at the minimum, weekly. The required maintenance cycle varies based on location, precipitation, and biologic activity. Desiccant should be changed on a regular interval, but that interval depends on ambient environmental conditions. Are the sensors on the tracker brand specific? No. Sensors are manufactured by Hukseflux, EKO Instruments, Kipp & Zonen, and Eppley Laboratory. Contact Campbell Scientific for more information, including sensor tracker compatibility. Is a solar tracker needed with the Solar1000? Unless the panels are tracking either in one axis or two, it is not likely that a tracker and pyrheliometer are needed. Does the Solar1000 work with protocols for SCADA networks? The CR1000 datalogger has built-in capabilities to be fully compatible with Modbus, as well as DNP3. The intention is to add additional compatible protocols as the industry and markets change and evolve. Does the CSP100 or Solar1000 require an expert to deploy? No. The main concern when installing the system is to ensure that the stand is secure to the ground and that the sensors are aligned and leveled. With patience, these tasks can be performed fairly easily. Can Campbell Scientific dataloggers communicate easily with the solar trackers? Depending on the tracker being used, a Campbell Scientific datalogger can request data, relay diagnostic information, and potentially control the tracker.